13.3.41 19:53 PM 38 South Island Place. No furniture remains on these premises & the building is now being demolished by the contractors. Notes No further services required - fire under control. The civil defence messages sent back and forth to the local ARP (Air raid precaution) depot read as follows..
16.4.41 23:26 AM Express Report. Fire at - Brixton Road - corner of Offley Road. Fire. 16.4.41 23:25 AM Express Report, Decca public shelter. 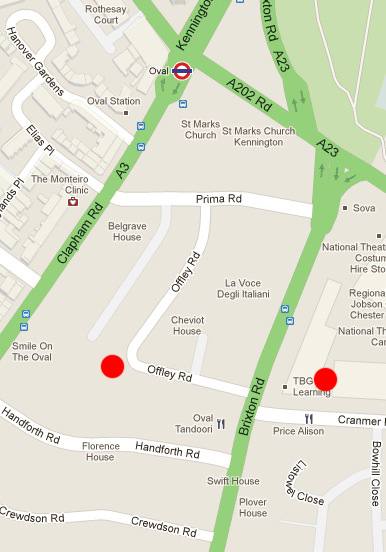 Casualties at Shelter 1-3 Brixton Road, entrance in Cranmer Road. 17.4.41 7:44 AM Supplementary Report Decca Gram Company 1/3 Brixton Road. 21:02 - High Explosive. Depot works destroyed by fire. Public shelter uninhabitable owing to severe blast and water. Fire brigade still in attendance. Following this incident Cromptons factory was also destroyed by fire and large adjacent area severely damaged by blast. RP/R required. 17.4.41 1:14 AM Supplementary Report Cromptons Factory - 1/3 Brixton Road. Owing to fire at the above address, have evacuated Decca public shelter. People put into nearby shelter. 17.4.41 12:21 AM High Explosive. 1-3 Brixton Road. Gas main burst and alight. 17.4.41 7:56 AM Supplementart Report Cromptons Factory - 1/3 Brixton Road.21:02 hrs. High Explosive. Owing to severe nature of fire spreading from Decca Ltd, Mears & Caldwell & Robinson's Ltd were badly damaged. Fire brigade still working on all above premises. Large area damaged by blast. 21.4.41 12:35 PM It hs just been reported to us by P.C 339 that the wall at Crompton's Ltd 1-3 Brixton Road is dangerous, threatening to fall into footway. Will necessary precautions be taken? 16.4.41 23:49 PM Express Report Fire at Sharwoods Factory, Offley Road. 17.4.41 7:58 AM Supplementary Report Sharwoods Factory, Offley Road, 21:02 hrs. Incendiary Bomb. Sugar boiling department entirely gutted. Casualties - nil. RP/R. required.